Asian stereotypes and racism revolve around us as we grow up as an Asian kid. 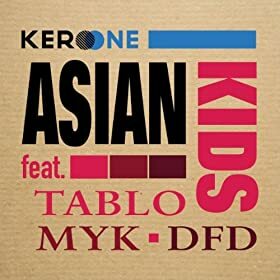 Kero One x Dumbfoundead x Tablo x Myk join forces to spit rhymes about the frustration of the the jokes from William Hung to martial arts to slanted eyes. These Asian cats tear down the racist wall to make a hit. Take a listen to the lyrics on the Asian Kids track. They bring their various rap styles to address the often controversial issues of Asians in America. Not only can you download the song on or amazon , but you can also see these cats perform this song live during the Dumbfoundead x Dok2 x MYK x Kero One Tour next week. you ever seen an Asian cat, say a rap and spit it quite like that? it’s the year of the tiger, hands up! pull out the tricks of yesterday just to display? I make this music cause I’m f***n’ good at that. Chinks, gooks, nips, put your fists up if your tired of it! This entry was posted in music and tagged dumbfoundead on May 18, 2010 by Kevin Hsieh - channel APA.